Pick a Benedict, any Benedict. The brunch menu stars a total of 11, including breakfast lasagna Benedict, fried green tomato Benedict, Benedict with creole shrimp, and Benedict with a crispy corn tamale; for your sake, we hope you’re not named Benedict, or things might get very confusing. On the side, ask for disco fries, deep-fried French toast balls, or the donut of the day, and remember: this brunch is BYOB, so don’t forget your poison. It’s not just the food that draws crowds, but the inimitable doorman, too -- he’ll even let you pick a spicy or mild joke while you stand in line. Do not fear the 7 train, friends. Flushing is just one stop beyond the Mets’ field of dreams, and there are dozens of dumpling-shaped reasons for making the trip. First among them is Nan Xiang Xiao Long Bao, where light, delicate dumplings swirl in flavorful broth. You can hardly call yourself a dumpling connoisseur if you haven’t slurped the crab-and-pork variety here. Bonus: they serve complimentary fresh ginger tea. If you like something or someone enough, you bring it/them home, right? 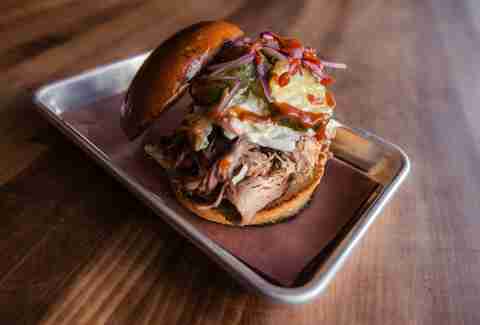 At Butcher Bar, you can sample the barbecue meats, then tuck a precious stack of brisket and a few sausage links under your arm and head home to relive the tenderness. Yes, brisket is not hard to find in New York, but brisket that is this lean, light, and downright delicious is as uncommon as it is irresistible. Ordering a sandwich at any Mexican restaurant is a rogue move -- and at Los Portales there’s a bulging carnitas burrito ($6.50) competing for your attention. But we urge you, put your trust in a torta ($5.50): a lightly toasted roll, crammed with cheese, beans, avocado, jalapeños, and your choice of marinated meat straight from the grill. And don’t be afraid to slather on the homemade green sauce -- it’s spicy enough to add zingy kick, but won’t pummel the other flavors into oblivion. 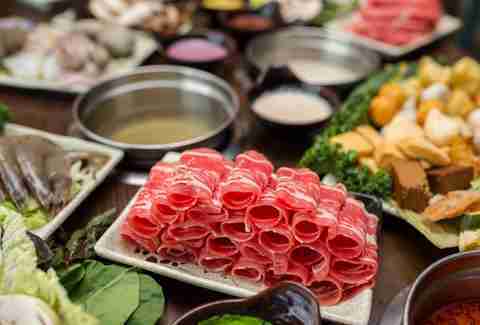 The herculean effort needed to drop your wafer-thin slice of meat into a steaming pot of spicy pork bone broth pays off handsomely at Spring Shabu Shabu. Supplement your chosen protein by loading up on veg and noodles at the buffet, and cook them to taste at your table. There’s nothing -- nothing at all -- wrong with cook-it-yourself Korean BBQ, but this is a lovely, lighter alternative. It’s a cheap thrill too, at around $7 for a tray of fresh shellfish and fillets (aka the seafood combo). Ramen is a difficult art to master, not least because of the multiple elements at play. Tamashii nails the broths (a clean, light shio or a more robust shoyu), but it’s the noodles that steal the show -- chewy yet delicate, and oh-so slurpable. Up for a change from the usual chicken and pork? Go for the champon ($14.25): a rich, spicy bowl of broth, filled to the brim with squid, mussels, and shrimp. Smorgas-what? 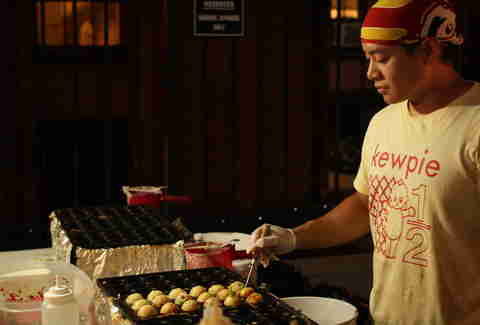 If you are a fan of sampling food from all over the world, head to the night market at the New York Hall of Science. Alas, it’s only open from spring until late fall, but in season, the hottest picks usually include Moffle Bar (mochi waffles), Gi Hin Mama Food (squid skewers), and Don Ceviche (raw fish served in cute little fishbowls). Expand your palate, kick back in the beer garden, and celebrate Queens’ moveable feast. 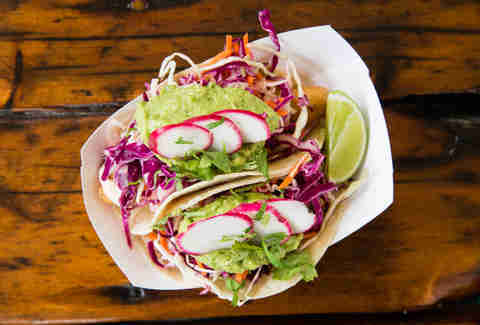 The good news: These are arguably (and boy would I argue) the best fish tacos in New York, and up there with anything California can offer. The bad news: It’s only open in the summer season, so keep your eye on the countdown clock. 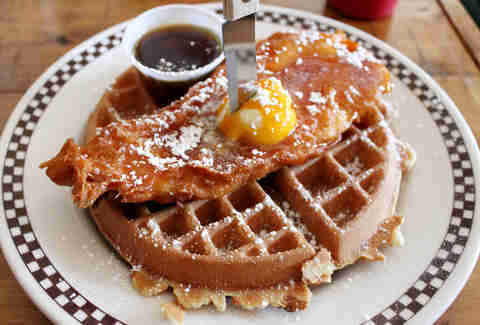 The other news: It’s served beneath the surfboards at a rustic beach shack inside the Rockaway Surf Club. 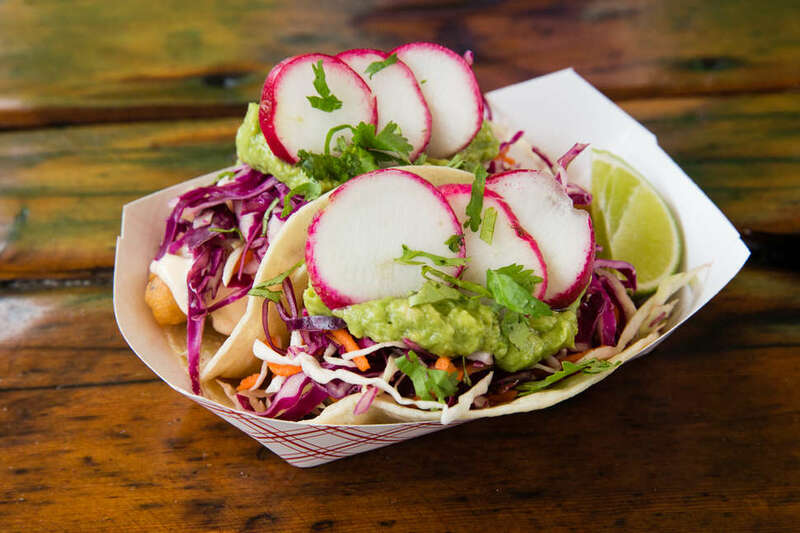 OK, so it’s a trek out to Rockaway, but these tacos combined with a cool watermelon juice are enough to make anyone forget the transit shambles on the way there -- consider the sand and sea just a bonus. Often, top cocktail joints suffer from disappointing and/or overpriced snacks -- no one wants to pay $8 for a bowl of olives or roasted nuts. 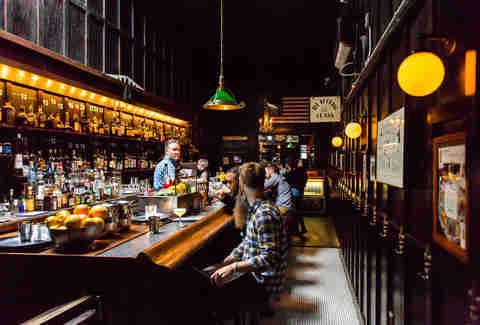 But Hendu’s at Dutch Kills provides the best of both worlds, with quality sandwiches to complement the masterful Old Fashioneds. You can’t go too far wrong with the beer-braised pork shoulder, or the beet and walnut pesto veggie option, but the top pick is the roast beef. It comes on a seeded basione roll, drizzled with gravy and a dash of horseradish. Better still, it’s served from 5pm right through to 1am, so you can probably fit in two sittings. Greek food and Astoria go together like yogurt and honey. Everyone lines up for the famous Taverna Kyclades on Ditmars Boulevard, but you can avoid that wait and head down to 31st Avenue, where a cozy, charming dining experience awaits. Not sure if you want meat or fish or apps? Try an entire spread of meze with up to 16 items, for under $30 a person. It includes a generous scoop of the classic hummus alongside tarama, quail, lamb meatballs, and crispy fried squid. 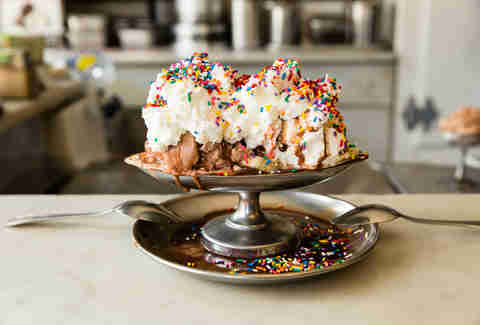 New York has its share of modern artisan ice cream shops (Ample Hills, Van Leeuwen, etc. ), but what about the old-school haunts, where chairs are twisted from wrought-iron and you have to scrape your spoon against a silver bowl to retrieve the last drop of hot fudge? Step forward, Eddie’s. Since opening in 1909, Eddie’s has stuck to the classics, and even now only serves a select bunch of favorite flavors. Still, nobody’s complaining. If you ever want to see fresh whole fish being filleted and grilled, just walk by Bahari’s open kitchen window. But the real action is inside, where grilled octopus, succulent red snapper, and pan-fried baby shark are among 20 seafood options on the fish-focused menu. The meals are served family-style, with crunchy salads and Greek dips on the side. Nicole Schuman is a Thrillist contributor.